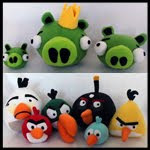 Obsessively Stitching: 3 Pigs Finger Puppets -- GIVEAWAY! 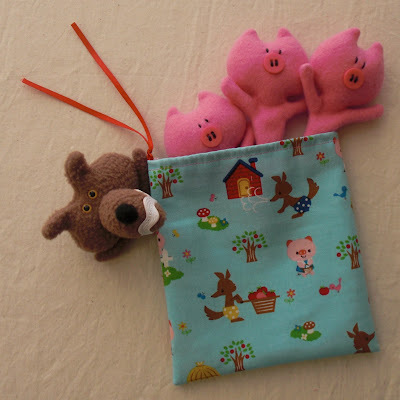 3 Pigs Finger Puppets -- GIVEAWAY! My family celebrates birthdays as weekly events -- so why shouldn't I do the same with my blog?? Let's do another bloggiversary giveaway!! 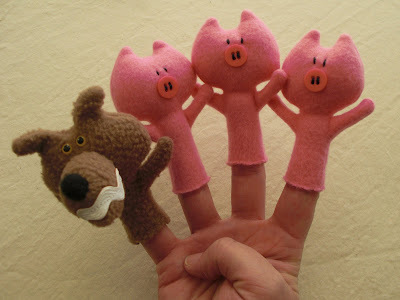 Up for grabs I have a set of finger puppets -- The Big Bad Wolf and the Three Little Pigs! I made a little pouch for them from my FAVORITE Japanese print. Here they are, all packed up and ready to be mailed to their new home! ~ Leave a comment! Make sure your email address is accessible to me! If you don't leave your email address, you can't win! ~ If you are a follower, leave another comment saying so for an extra entry. I prefer SHORT giveaways, but in the interest of some of my international readers who completely missed out on the last giveaway (so sorry!! ), I will make it a little bit longer and leave comments open from now until Thursday at 9:00AM. As always, I will pick a winner via Random.org. Please count me in! My son would be over the moon for these! Awesome, I'm first! I think that's lucky. My son would LOVE those. Cool! Oh my goodness my girls would flip if I won this. They love puppets, and three little pigs is one of their favorite stories. I am a follower! Thanks! So cute. My daughter would love these. Those are so cute! I would love them! these are so fun and cute!! great giveaway!! Seriously!?? Birthday weeks are awesome, and I'd love to be entered in the drawing, those piggies are the cutest! These are so cool. 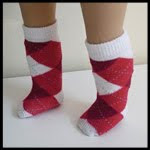 My friend that does storytime at the library would love them! So cute! My kids would have a ball with this precious little set! Oooh...and I'm a follower, too! Oh I hope their new home is in Georgia. Fingers crossed. OMG, these are so cute! I'd love to have them. my kids would love these!! Theses are so cute! My little girls would love to win them. The currently have a small collection of finger puppents, but none that tell a story. Oh, I just have to enter because these little guys are the whole reason I found your wonderful blog in the first place. And right after I found you, I followed! I want to WIN!! I LOVE the little Japanese fabric for the bag too - how perfect! I'm a happy follower of your blog! I follow you real close too! oooou cute! My bear would love those fellows. ohhhh cute!! I want a chance to win! Oh how cool! I loved those little piggies when I first saw them, and my son would be thrilled if we won them! Oh this would be so fun for my 4 year old! These are fantastic! I love them. These are so cute, my kids would love them! oh my those are so darling!!! The fabric bag is just as cute! Would love to win them. Thank you! I'm a follower and I love your blog! So inspirational. I've been breaking out the old sewing machine a lot more lately. I love these puppets! Pick me! I love this giveaway, the finger puppets are adorable! Awesome! My son cracks up at my very poorly acted randition of the three little pigs, he would just love these. I would love to enter. my twin boys would love to have a go at them. Oh these are just too cute!!! I will definitely needs to make a set of these if I don't win. Gotta keep the new grand baby that is coming happy! 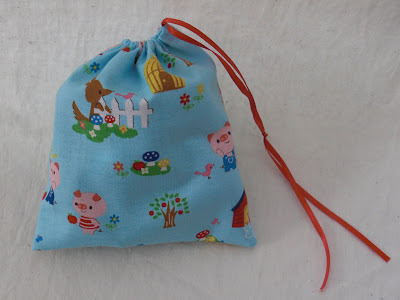 Where did you find the material for the cute little bag. Just love that! I've only been following you for about a month but already addicted!! Checking the reader everyday for what you are up to that I can shamelessly copy! and here's the second entry...! Googling "Red Riding Hood finger puppets" was how I first found you so I'd love to win a set of your cute puppets! My girls are mad for thes little piggies. Oh and I follow you on bloglines too. Hmmm - should have written that here - I follow you on bloglines! Oh, my Christianna would love these! 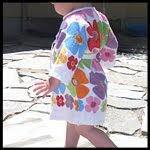 I have been following your blog for a couple months now and "love it"! Jax would LOVE these too...and they'd go great with the puppet theater I'm planning for her Birthday! And YAY...I made it for this one! Thx for extending the time! And You bet I follow! Love your work Lady!!! I am definitely a follower! I could use these in my classroom! I would love to win! My daughter would love these! My niece would love these! ANYWAY...I NEED THESE! Our children's librarian is being transferred and these would be a wonderful going away present. I love these and so would my kids. these are soooo cute!!!! my son would love these!!! 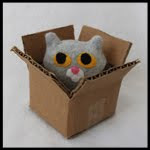 My kids would LOVE these- we're having so much fun with some finger puppets I made- but they're much lamer!!! My daughter would love these puppets! I'm a follower of you. Very Cute! What a fun set. I love those little puppets. My 20-mo-old girl and I would have a great time blowing down houses with them! :) Thanks for the giveaway. Very cute :) Avery LOVES puppets! She would get a kick out of these! Would love to win these for my girls! My son would love those!!!! i've been wanting to make these!! hope i win them :) thanks! I've loved these since you featured them and I've been meaning to make some...I'm crossing my fingers! LOVE these and thank for the opportunity to win! Oh, these are so cute! It would be so fun to act out the story with my kids. Oh my goodness! These are awesome! Ya know, I don't even think we have introduced the story of the three pigs to my daughter. Your puppets would be so perfect! those are way too cute care, and the bag for them is fabulous! Those are so cute! They would make story time so much fun. I'm also a follower. And in case you don't have my email from the google account, it's aemastin at gmail dot com. I also am a follower! 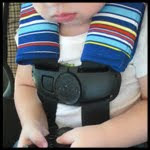 This would be great to add to my early intervention toy collection! 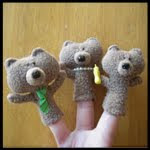 My 4 boys would love these finger puppets! I stumbled across your blog several months ago and i'm going to try to tackle a mini version of a quilt during my vacation! thanks. Those area adorable - I would love to introduce the story of the 3 little pigs to my girl with those! So nice, so cute, so little :) Is there any chance to have them?? These are so so so cute!! Thanks for the giveaway! Happy Bloggiversary!! I would love to win these. I believe that you were the one that laughed when I said that you were "popular"!! Well I think this proves it! I would love to be in the giveaway! K.. I'm also a follower. Come on...piggies! Oh they are so cute, my girls would love them. And yes, I am a follower. Oh, so nice. This time I can join!!! :-) The woolf looks really cool! Love it! These are adorable !! !DD loves this story !! love it! also. it just occurred to me now why the wolf was after the 3 pigs. he loves bacon just as much as the next person. wendiwinn at wendiwinn dot com. i follow you. it's not as creepy as it sounds thanks to the whole follow widget. I love these! They are adorable! too cute - it's killing me! Absolutely ADORABLE! My daughter would LOVE these! She is SO into finger pupets right now..plus Little Red Riding Hood is one of her very favs! Thanks for the chance to win! Oh, hooray! Sign me up, please! Oh, and I am indeed a follower! Ooh, this would be so fun in a preschool classroom! Pick me! Love your blog!!! My kids would love these puppets! I´m a follower too. Hey there Care .... "I'll huff & I'll puff ...."
Love your ideas as usual! Yes Yes - I follow you! that is way to cute!!! i would realy love to win that!! so cute! and i follow you via google reader.